Energy Casino Review 2019 | Do they have what it TAKES? Energy Casino was launched in 2015, aiming to be a difference maker in the world of online gaming. They have accomplished this by putting the focus on a gaming provider that is neglected by many other casinos: Novomatic. There is also space here for NetEnt and Microgaming, so fans of those illustrious providers will also be pleased with what’s available here. Energy Casino is the sister site to EnergyBet, the sports betting site which sponsors English football club Millwall, so when you sign up with one site you have access to the other. The Energy Casino also offers a range of tournaments where you can compete with other players, and there is an Energy Shop with a difference: it doesn’t accept your money! In fact all the products on sale – electronics and clothes, mainly – can be exchanged for Energy points which you accumulate as you play games on the site. 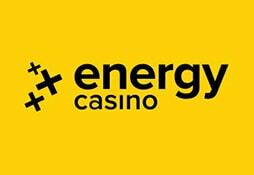 Energy Casino is based in the online gaming hub of Malta, in the Mediterranean. It is owned by a company called Probe Investments Ltd, which does not operate any other sites. Energy Casino is licensed in both Malta and the UK, so security and fair play are guaranteed here. The site design is pretty rudimentary, with none of the flair and humour to be found in many modern sites. Perhaps this is a reflection of the fact that they have focused on the utilitarian Novomatic games provider, as these games tend to be fairly old-fashioned when compared to modern developers. This is certainly an interesting site, and one that stands out from the crowd, if not always for the right reasons. Energy Casino welcome new players with a matching bonus based on your first deposit to a maximum of £/$/€150. A minimum deposit of £/$/€10 is required to receive a bonus. To be able to withdraw the bonus (and any winnings from it) you must bet through 25 times the bonus plus deposit, which is not particularly generous. Bets placed on table games and a selection of high RTP slots will not count towards your wagering requirement. You will also find reload bonuses available on the site, plus you can enter one of the excellent tournaments which are available on the site. You won’t have any issues making deposits or withdrawals to and from Energy Casino, as there are multiple payment methods available. That means Visa and MasterCard are available, as you would expect, along with a variety of banking options which vary according to your country of residence. These include Moneta, Zimpler, Sofort, MultiBanco, iDeal, Entropy, GiroPy, Yandex and Euteller. More than enough to satisfy even the most demanding customer! Plus you have the popular Skrill and Neteller e-wallets, as well as the prepaid vouchers from Paysafecard. Energy Casino has one of the biggest selections of Novomatic slot games you will find anywhere on the net. So if you are a fan of classic Novomatic slots like Book of Ra, Cleopatra, Columbus and Temple of Secrets then this casino is just what you need. Novomatic have long been popular in Central Europe, but their slots can seem a little dated when compared with some of the more progressive developers out there. If Novomatic is not your favourite then there is still a decent selection of NetEnt and Microgaming slots to choose from. After that you are talking about some relatively obscure developers such as Wazdan, Oryx, BF Games, Edict and UC8. In an online gaming market where so many casinos offer a very similar selection of games, there is no disputing the fact that Energy Casino brings something different to the table with the 400 or so games on offer here. You can get in touch with Energy Casino either by phone, live chat, email or even by snail mail to Malta, if you so desire. They are not available 24/7, as Customer Support is only from 9am to midnight (CET) during the week, and from 1pm to 9pm at weekends. The FAQ section is quite basic, but will answer most of the big questions for online casino newbies. As the site is licensed in both Malta and the UK, security will not be a concern as these regulators demand the highest standards from license-holders. The first impressions when you enter Energy Casino are not good. Compared to online casinos launched around the same time, this site looks very safe and unimaginative. The game selection is certainly different, as it is rare to find so many games from developers like Novomatic, Oryx and Wazdan on a modern casino. If you are fans of one or more of these developers then you will be delighted with Energy Casino, but it must be said that not everybody is in love with these slot providers. A definite plus is a reward scheme which offers physical gifts like baseball caps, t-shirts, headphones and watches. The tournaments are also great fun and a real incentive to play. Energy Casino will not be to everybody’s taste, but at least they are offering something different in this crowded market.